Long pepper is also known as Indian long pepper, which has a flowering vine. Being a fragrant plant, it is the most popular and interesting herb. 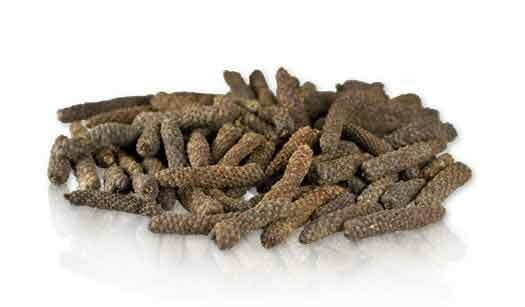 Long Pepper treats many diseases or disorders related to head, tooth, weight gain and many others. Long pepper is also known as Indian long pepper, which has a flowering vine. Being a fragrant plant, it is the most popular and interesting herb. It grows in temperate and warm areas of India. Its buds are useful. This is one of the most important reasons why it is used as herbs and spices. Long pepper contains fragrant and volatile oil, which is known as pipla-sterol, sesenin and piplatin. The root of this plant contains glucosides, steroids, piperin, piperlonguminin and piperlartin. People must use this herb because of its number of benefits. Insomnia is a disorder, which gets treated with the use of this herb. The mixture can be prepared by taking long pepper, raisin, black pepper and ginger root into one solution. Cook this powder using the butter, strain the mixture and provide it to the patient.